All babies are now born pre-polluted. Starting before birth, children are exposed to chemicals that impair normal growth and development. Chemicals accumulate, interact within the body, cause illness. And get passed on from parent to child for generations. The sources for body burden are everywhere — industry, foods, and many that are not obvious. At least 75,000+ chemicals are used extensively and 43,000,000+ are cataloged. Approximately 1,000 new chemicals are introduced each year. Inadequate data exists regarding the chronic (long term, low level) health risks of most chemicals. 'The dose makes the poison' is generally regarded as simple and true. If a dose is low enough to cause no effect, there seems no reason to test lower doses. Chemical safety policies are based on this 600-year-old premise. 'Safe' levels of exposure are based on the lowest levels tested with no effect. Now we realize harm can occur at much lower thresholds than previously considered possible. 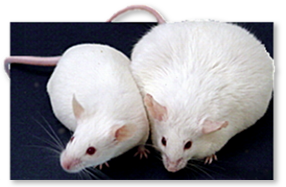 For example, these mice are genetically identical and shared the same diet. The mouse on the left is normal. 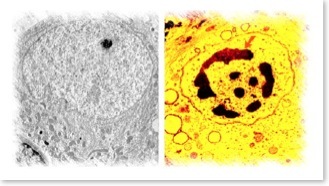 The mouse on the right was exposed to 1 part-per-billion (ppb) DES while in the womb. For decades it was assumed such tiny exposure would have no effect. When smaller amounts cause greater effects than larger amounts the effect is called hormesis. Scientists are learning that many chemicals exhibit hormesis. Furthermore, the timing of toxic exposure plays a much more significant role than previously recognized. As a result, current safety standards based on higher dose experiments don't guarantee shelter from toxic levels of exposure. Toxological data typically describes the effect of a chemical when it is isolated from as many variables as possilble. In the real world, pollutants interact in complex mixtures and conditions. A wide range of conditions are at play, and chemicals can behave very differently when combined with other chemicals. Harm can be amplified when chemicals are combined. Even the body's own natural chemicals, such as hormones, can enhance synergistic toxicity. Heavy metals, organophosphates, and other chemicals damage cells by excitotoxic activity. Excitotoxins are deliberately added to a wide range of foods and drugs. Genetic susceptibility plays a role in body burden. For instance roughly 20% of the population have genetic inability to excrete heavy metals effectively. Their toxic burden accumulates faster, their illnesses are more obvious. They are the "canaries in a coal mine" in an environment that is increasingly toxic. New evidence is showing that each person has an individualized genome — a unique pattern of whole DNA sections gained or lost. Some chemicals change genes and epigenes on-the-fly. Some of these genetic changes become permanent and are passed down in heredity. Viruses, bacteria, yeasts, parasites, and mold aggravate body burden at any stage of life. Research is revealing that some microorganisms interact directly with chemicals to boost infection. The Centers for Disease Control (CDC) is running the National Biomonitoring Program (NBP) started in 1998. Every two years the NBP attempts to assess exposure to environmental chemicals in the general U.S. population. The more chemicals they look for, the more they find. Data shows people typically carry at least half of the 200+ toxic chemicals monitored. Chemicals have been detected in the placenta, umbilical cord blood, bloodstream, and body fat of infants as well as in the human breast milk they drink. This study found babies averaging over 200 industrial chemicals and pollutants in their umbilical cord blood, with 287 chemicals total. A follow up study found 232 toxic chemicals in 10 minority babies. In 2007, California launched the nation's first statewide biomonitoring program. The first report is currently due by July 1, 2012, with new reports to follow every two years. The spectrum of both 'rare' and 'common' illnesses is on the rise. The connection with body burden is growing clearer. The NIH defines a rare disease as one affecting 200,000 or fewer Americans. 25 to 30 million Americans suffer from one of the nearly 6,800 identified rare diseases. That rivals the 40 million Americans with one or more of the three "major" diseases: heart disease, cancer or diabetes. Toxics that were banned decades ago persist in the soil, air and water. They can still pass through the skin, nostrils or mucus membranes and into the bloodstream and body tissue. In this Washington state study, ALL participants had detectable levels of PCBs, while 8 out of 10 had DDT in their blood. The problem will multiply without a new course of action. For example, the Kid-Safe Chemicals Act (KSCA) seeks to overhaul the Toxic Substances Control Act (TSCA). This legislation requires chemicals to be proven safe before entering the market or to remain in commerce. Each person's body burden is likely to fluctuate over the course of hours, months, and years depending on their particular exposures and metabolism. The science of body burden is complex and still in early stages. Listen to the October 19, 2006 public radio broadcast of KQED's Health Dialogues. It covers Prop 65, body burden, and biomonitoring. Or simply search phrases like chemical body burden and human biomonitoring.